Hi! My name is Fred. My registered name is Cinder Lane Fred. 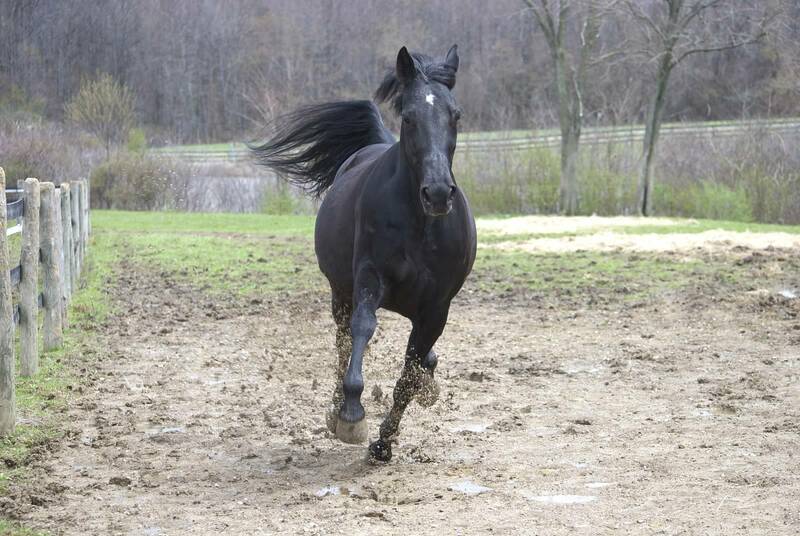 I am a black Standardbred gelding, born in 1995 that stands about 15.1 hands tall. I was donated in September of 2006 when my owner moved to Missouri. I am a little on the leaner side compared to some of the big draft guys around here. I was on the track for several years before being retired. My donor, Stacey Pace, gave me a wonderful home! We went on lots of trail rides – sure was a lot different than the track. You may notice I move a little different, I am a trotter. Check me out when I am playing in the pasture – I have a lot of action. I love the attention I get here at Fieldstone Farm. I enjoy a good grooming, but I may try and chew on the cross ties. It is a good thing I like a bath, because I sure can get muddy too! I look forward to meeting you in class. I am in both the riding and driving classes. I consider myself a pretty laid back and easy going guy. I am not afraid of any of the ring activities – I find them quite entertaining. I lead easily and have a slow walk. Watch out when I trot because I can really cover some ground. Don’t worry, I am not running away from you, it is just how I was trained to move. I come back to a walk very easily. See you soon!